DIY projects bring me just joy as a homeschool parent and person. Just something about creating something from materials on hands that make me feel accomplished. 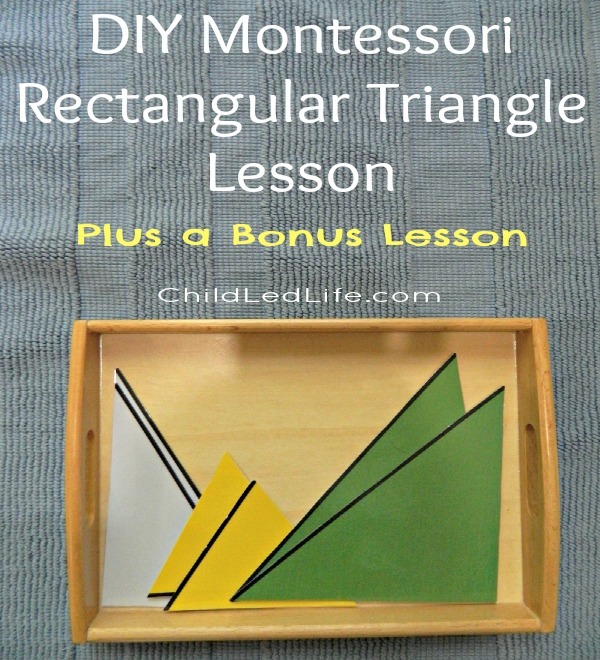 Use this DIY Montessori rectangular triangle lesson for a great lesson for your preschooler. 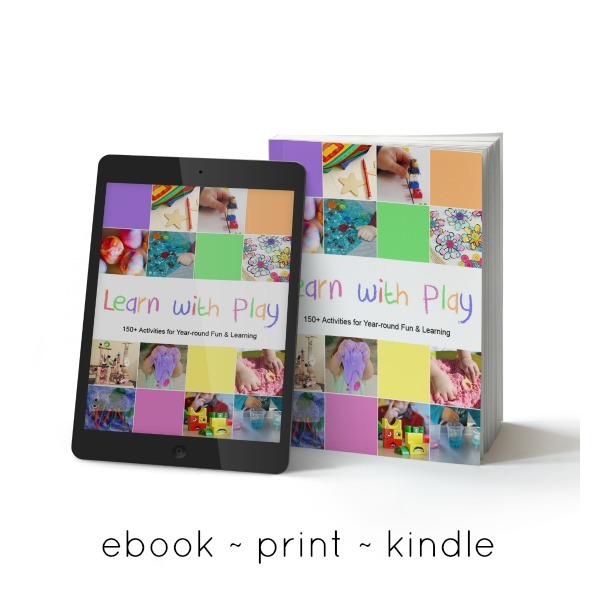 Don’t miss the bonus lessons for the younger sibling! 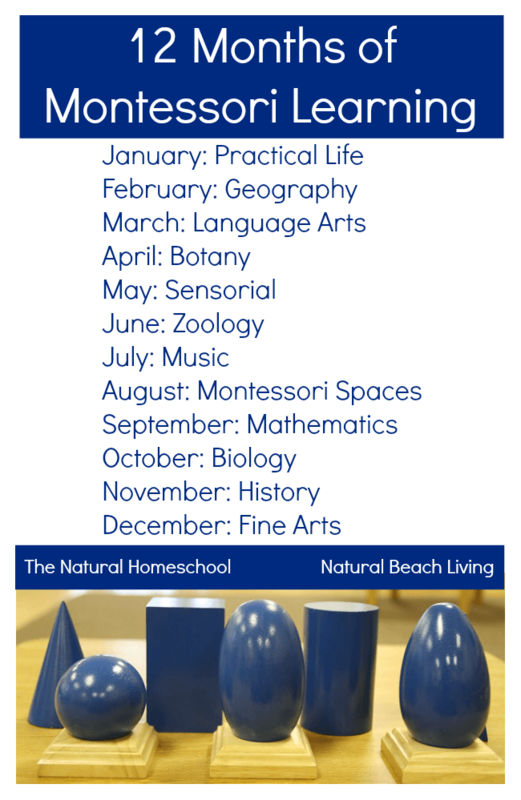 May is sensorial month for the 12 Months of Montessori Learning series. 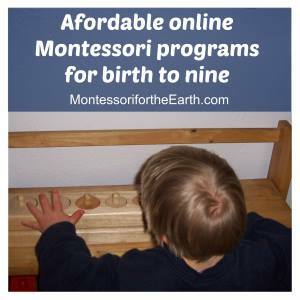 Don’t forget to check in on all the post this month from 10 other wonderful Montessori bloggers. Find all the links at the bottom of this post. 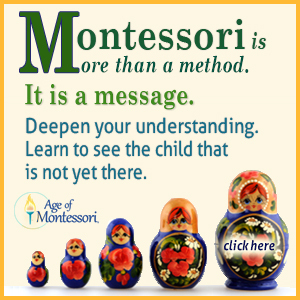 What is Montessori Sensorial Work? 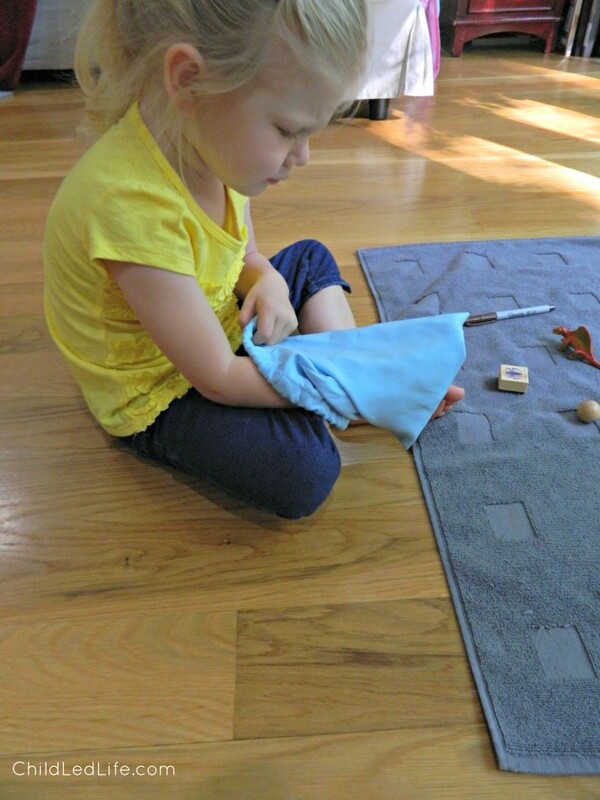 Sensorial has been the hardest Montessori area for me to understand as a self taught Montessori parent. For me it is a sense of the environment. 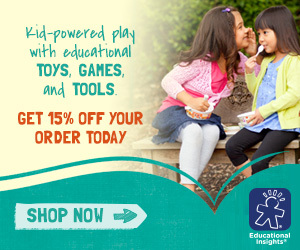 A child learns how things in our world move together and interact with each other. 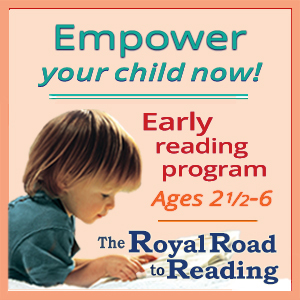 Studying the environment through sensorial work, the child begins to develop a deeper understanding of the world. Rectangular triangles lesson is given in preparation for geometry. This lessons demonstrates how all plane figures constructed with straight lines are composed of triangles. Rectangular triangles lesson is intended for 4-5 year olds. To prepare the materials, download the Constructive Triangle Box 1 from the free download on Montessori Materials. Print on card stock with color printer. Cut out each of the triangles. Laminate the triangles and trim as needed. Once the triangles are prepared, you can prepare the lesson by placing the yellow equilateral triangles, the pair of gray scalene right-angled triangles, and the pair of green scalene right-angles triangles on a tray. I watched this video to help me understand how to present lesson one of the rectangular triangles to Samuel. After watching the video, this is the process for presenting the lesson. Ask your child to prepare a work area with their work mat. Bring over the tray with the prepared triangles. Move all triangles one at a time to the mat. Choose one green triangle and move it to a cleared space on the mat. Choose the other green triangle and match to the other green triangle, using the black line as your guide. 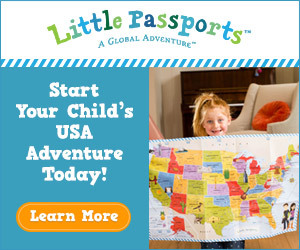 The child should notice you have made a square. Move the square to the top left of your work mat. Repeat steps 4-7 for the other two pairs of triangles. 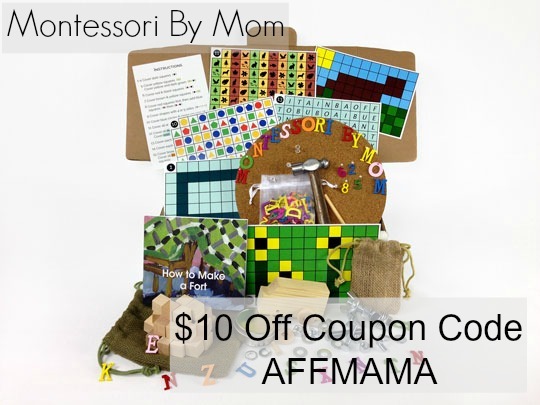 Once you have demonstrated all the shapes (square, rectangle, and parallelogram), mix up all the triangles and allow your child to work the lesson. After they have completed the lesson, ask them to replace all the triangles to the tray and put away all lesson materials. One of the struggles of being a homeschool parent is keeping your toddler entertained while you give a lesson to the older sibling. 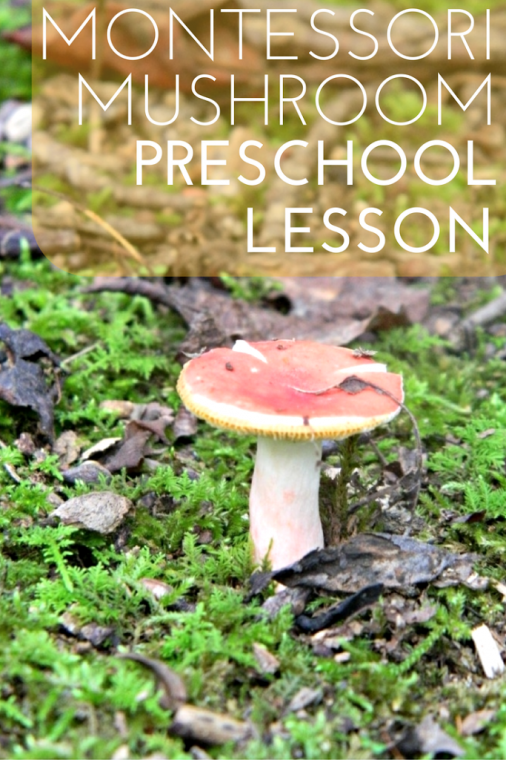 On almost all of my Montessori lessons, I add a little work for the younger sibling. While Samuel worked on the rectangular triangles, Avalyn worked with a DIY mystery bag. She LOVED this work. 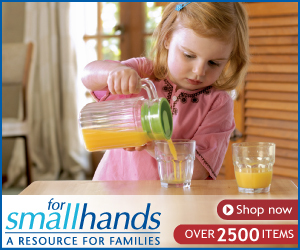 Your little one will too! Present the bag and let your child know it is a mystery bag and we do not look inside. Place one hand inside the bag bag and choose an object to feel. Place the object to one size and choose another object to feel. Allow the child to work with this material. This is a easy material to put together and one that will keep the younger sibling busy to a good while if you add enough items. 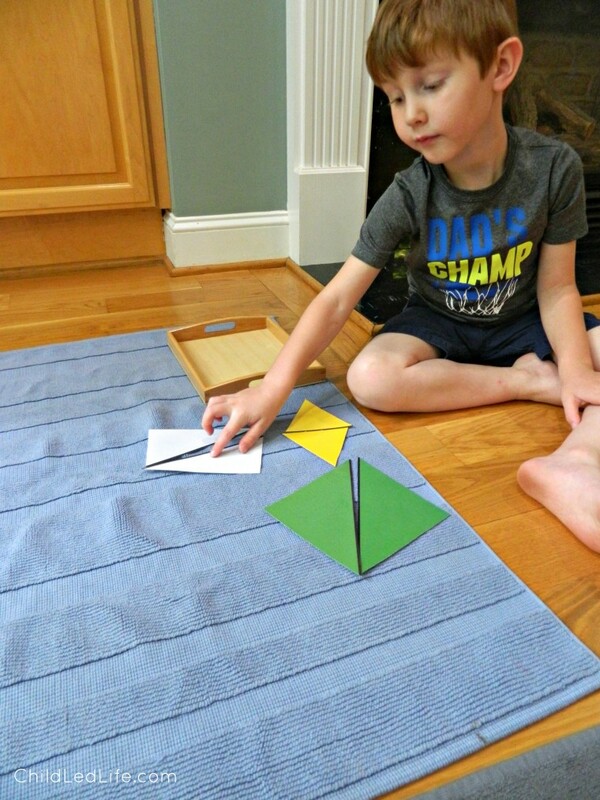 Here is a very helpful collection of DIY Constructive Triangles on Living Montessori Now. I love these simple activities. The mystery bag is always a hit with preschoolers! We’ve hidden all sorts of things in there before, especially my son’s favorite toys like little toy cars 🙂 Thanks for this! What a great way to prepare the constructive triangles. I love the mystery bag too. Very fun! We love the rectangle boxes and will definitely refer to this post when i present them again! I love having resources for making my own DIY Montessori materials! This looks fun! 🙂 I love the mystery bag too! I have a mystery bag in my classroom and change the objects in it each month to correspond to the continent or holiday we are studying. Hi Susan! That is a great idea. 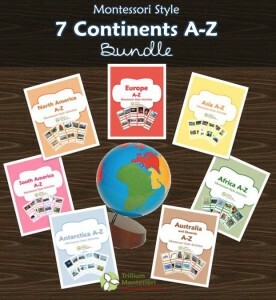 Continents are a lot of fun to study and adding a mystery bag would really pique the kids interest! Pinning this one for later – I love the mystery bag idea too. Clare’ last post was: 10 Fabulous Patriotic Recipes for Kids – Celebrate the Red, White & Blue! What a great way to teach shapes. The mystery bag must come in really handy.